There’s a lot of great music in downtown Northfield this weekend. The performers are local bands…musicians from the Northfield area…and local bands…musicians from Southern Minnesota…and local bands…musicians from Minnesota. So come on down(t0wn) and listen to the (local) music…this weekend in (downtown) Northfield, MN. Friday, May 25th: Carey Langer, 5:00 to 7:00 p.m., Contented Cow; Spruce Top Review, 8:00 to 10:30 p.m., Contented Cow; Art Vandalay, 8:00 to 1:30 p.m., Tavern Lounge; Carleton Orchestra Concert, 8:00 p.m., Concert Hall on the Carleton College campus; The Wreckless Band, 9:00 p.m. to 12:00 a.m., Upstairs Rueb; and Fred the Bear, 11:00 p.m. to 1:00 a.m., Contented Cow. Saturday, May 26th: Joe Kroc and Nate Johnson, 5:00 to 7:00 p.m., Contented Cow; Pot Luck and the Hot Dishes, 8:00 to 10:30 p.m., Contented Cow; Bonnie & the Clydes, 8:00 to 11:30 p.m., Tavern Lounge; and D J Music, 9:00 p.m., Rueb’N’Stein. Sunday, May 27th: Politics and a Pint, 6:00 to 8:00 p.m., and Quiz Night, 8:00 to 10:00 p.m., Contented Cow. 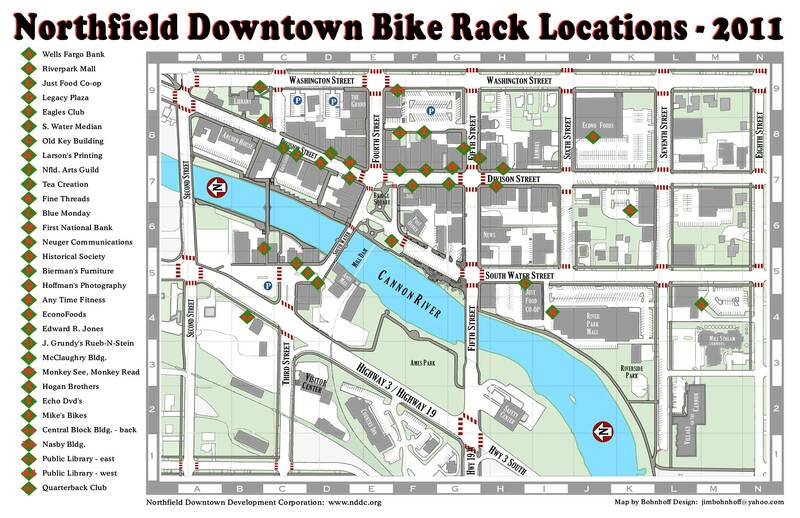 As part of a community-wide effort to encourage bicycle transportation a few years ago, the NDDC produced the first Downtown Bike Rack Locations Map. It showed the locations of all the bike racks, both privately and publicly provided, in downtown Northfield. Weekend Highlight? Eating Ice Cream at 20 Below! Sure, pound for pound, Northfield probably has more art than any other town in the country. 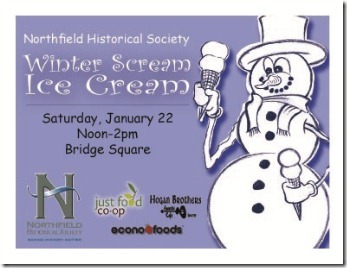 However, what is more “Minnesotan” than eating ice cream…outside…when it’s 20 below zero? So, this event is my “pick of the week”. 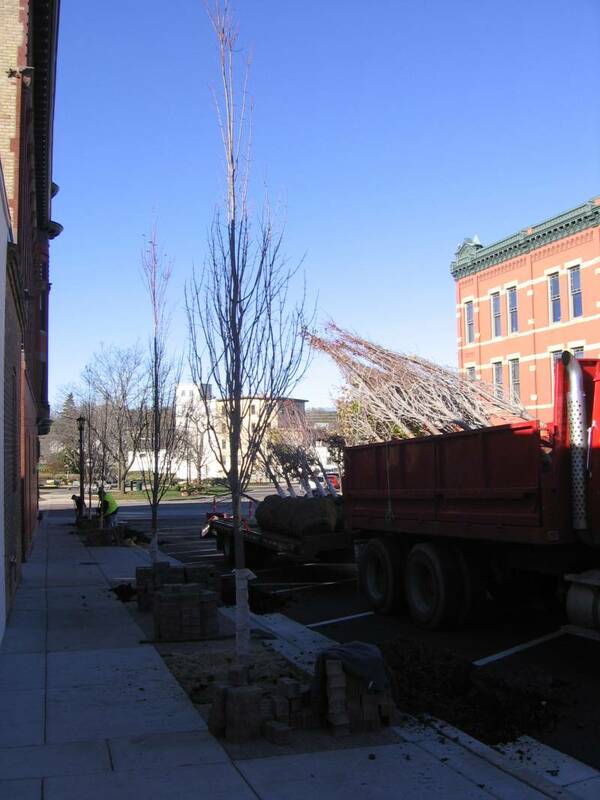 Crews were busy planting new trees on 4th Street this morning. City of Northfield staff had indicated that they were waiting for the first frost as the transfer would be less traumatic. With our unusually warm fall, it was a long wait. It was well worth it, however. It’s good to see the trees back on 4th Street. The trees provide a visual, natural link between our historic buildings and our scenic river in our historic, scenic, and authentic downtown. Thanks to the citizens who advocated for the return of the trees, and thanks to the City Council for being so diligent in assuring their return, and thanks to City Staff for coordinating the return. I look forward to seeing them leafed out next spring. 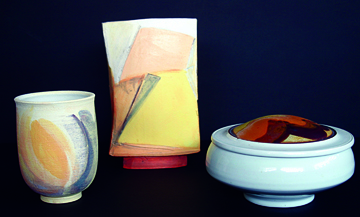 Thursday, August 27th, from 6 to 9 p.m. there will be a reception at the Northfield Arts Guild (304 Division Street) for the opening show “Color, Brush, and Form: The Fine Art of Function”.